First of all, let me welcome you to 2015 and my first post of the new year, how exciting! I'm so excited for the new year for all that's to come, and I'm sure many of you are also excited to make this year the best one so far. As many of you know, as a pale redhead, my hair is pretty fair and therefore so are my brows and lashes (how irritating, as mascara runs out so quickly for me!). It's rather difficult to find something to use in my brows, that is both light enough for my them so it doesn't look harsh or unnatural, and that actually makes a difference to them and gives them fullness and colour. However, after months of experimenting, from wearing nothing to now discovering a pair that works perfectly, I feel like my brows are finally looking their best, thanks to these two products. MAC Eyeshadow in 'Cork' - this beauty is my new holy grail brow powder fo' sho'. I find brow powders a million times easier to get right and much more natural looking on the brows for me, so when I found this shade from MAC, I knew it was the right product. The colour is a perfect match for me, I'd say 1-2 shades darker than my natural brow colour which is pretty much blonde, so now with a few light strokes of this through my brows, they match my hair pretty much perfectly and I noticed that my face looks a lot more framed with a stronger brow. I would so recommend MAC shadows for your eyebrows, I know that a lot of beauty bloggers and youtubers use shades like 'Charcoal Brown' (good for darker brunettes) and 'Omega' (one for darker blondes and light brunettes) but if your hair is red like mine, Cork may be the one for you. Benefit Gimme Brow in 'Light/Medium' - I finally gave into the hype with this little product and I so don't regret it! This brow gel has been so raved about recently with beauty bloggers, and when my friend used it on me, I knew I had to have it for myself. 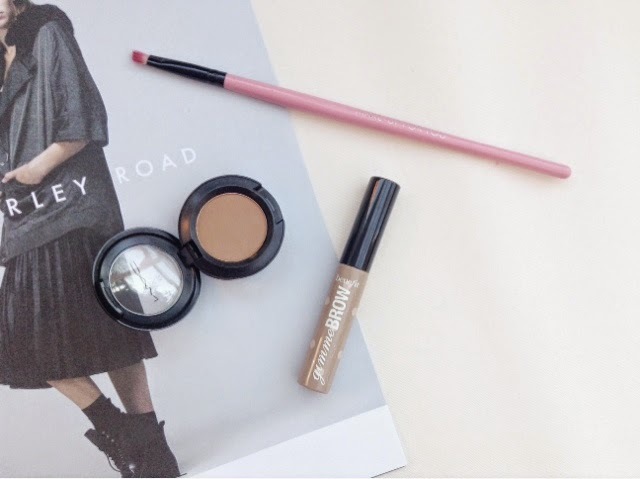 I've tried brow gels before, like the one from Maybelline but this one is very different, it has a lot more colour and gives a more natural look to the brows by adding little fibres that give the illusion of thicker brows and real hairs. I use this over the powder and then brush through lightly with a spoolie to give an even more natural look, and I couldn't be more pleased with the result! One thing I must say is that the Gimme Brow only comes in two shades and mine is the lightest one, which isn't all that light! If you want a super natural brow or your hair is even lighter than mine, you may want to get this tried on at a Benefit counter to see if it's definitely for you. So tempted to get gimme brow, love how it has a smaller spoolie!